Welcome to new school year! Third grade teacher Lisa Reese gives incoming third grader Karis Martini a hug during the Indian Lake Elementary Open House on Aug. 20. Hundreds of families attended Indian Lake’s All Schools Open House Night. Freshman Cayden Nessler and Kendall Cotterman pick up their schedules during the Indian Lake High School Open House Night on Aug. 20. Students and parents met teachers, grabbed schedules, paid fees, found lockers, talked with district transportation officials and filled out online forms during Indian Lake’s All Schools Open House Night. 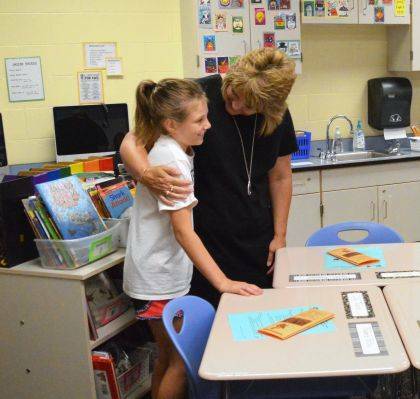 https://www.weeklycurrents.com/wp-content/uploads/sites/13/2018/08/web1_Photo1Web-2.jpgThird grade teacher Lisa Reese gives incoming third grader Karis Martini a hug during the Indian Lake Elementary Open House on Aug. 20. Hundreds of families attended Indian Lake’s All Schools Open House Night. 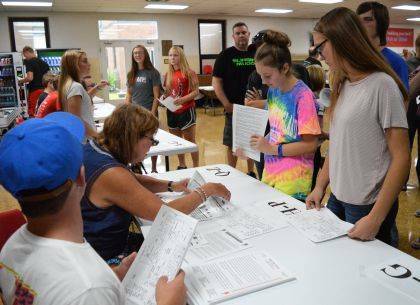 https://www.weeklycurrents.com/wp-content/uploads/sites/13/2018/08/web1_Photo2Web-2.jpgFreshman Cayden Nessler and Kendall Cotterman pick up their schedules during the Indian Lake High School Open House Night on Aug. 20. Students and parents met teachers, grabbed schedules, paid fees, found lockers, talked with district transportation officials and filled out online forms during Indian Lake’s All Schools Open House Night.